Photogize Lab 6 combines the best parts of our award winning RasterPlus and Lab software products. The result is a simple-to-use, super-fast photo fulfillment tool. Still using Version 5? Update here. With our new ProductSheet, all your standard and CloudCover products can be managed in one spreadsheet-like window. You can now apply one set of properties to multiply selected products. You can sort products on multiple keys, and you can subset your product list by using the handy search tool. Publish and price CloudCover products with Lab 6. All your CloudCover Products will appear in the new Lab 6 ProductSheet. Just price, publish and go! You can also purchase CloudCover product packs right from the Lab 6 ProductSheet! We’ve taken the most popular wet and dry minilab drivers in RasterPlus and embedded them in Lab 6. Production has never been faster. Or easier. Lab 6 supports SIX fulfillment types. You can print to disk, print directly to a minilab, print to PDF, print to a Windows printer, or print to any legacy RasterPlus queue. You can also direct gift jobs to be fulfilled by Liberty Gifts. Lab 6 harvests online orders from Photogize Hosting, PrintWizard, PhotoCentral, and EventPro. It also harvests online and local Photogize Kiosk orders. Just one click sends your entire order to the appropriate device or folder. You can setup a number of SMTP or MAPI email triggers that will get fired on any number of Lab 6 events (order harvested successfully, order printed successfully, etc.). These emails can be sent to the customer, the lab manager, or any valid email address). 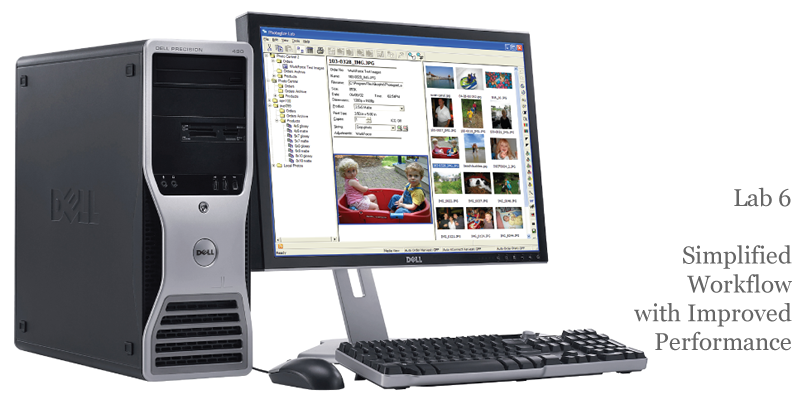 You can archive aged orders to CD or disk along with all attached photos. These archives can be imported into Lab 6 at a later date. You can also export the order data in Lab to an Excel spreadsheet file or CSV file for analysis and tracking. You can manipulate photos in Lab 6 in a number of ways. You can zoom, crop, lighten, darken, and adjust colors. You can even remove red-eye and edit the photo in Adobe® Photoshop® with a single click. And if you enable the Photogize Lab 6 ICC CMM, you can do all this in a controlled, color accurate workflow. You can define business rules (product pricing, ship types, logos, promotions, etc..) for most Photogize systems, including PhotoCentral, PrintWizard, EventPro, and Kiosk. Credit card processing via Authorize.NET and WorldPay is also supported. The easiest way to process credit cards directly into your merchant account is through Authorize.NET. Click here to sign up. You can install multiple copies of Photogize Lab at different locations and then define Harvest Rules which will route orders to a store based on the customer-selected pickup location or shipping method. You can even define a rule for splitting orders to print some products at one location and some at another.